Last night I grilled with coconut charcoal. It's made with coconut shells and some dried coconut (probably to help hold it together). 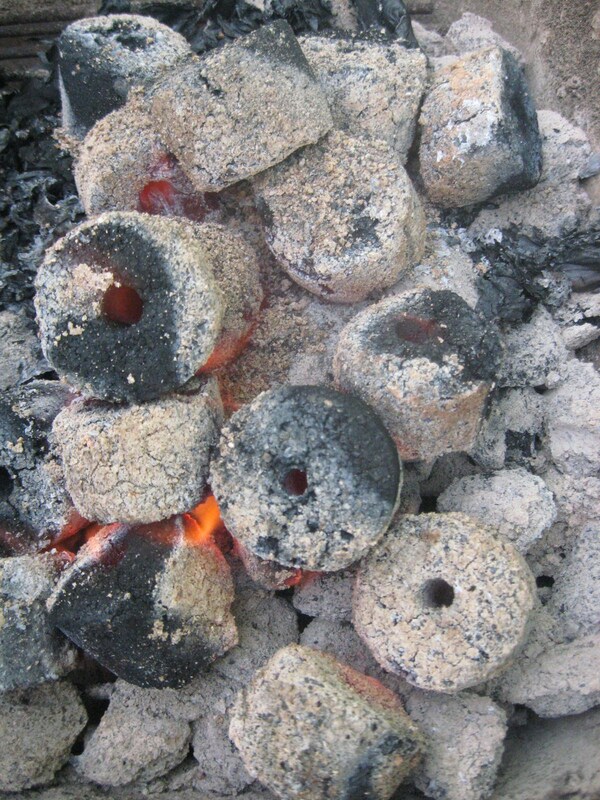 Grilling with coconut shell charcoal means you have a sustainable product that is environmentally friendly. Really now, how many coconut shell bras are needed even for the Parrotheads at Jimmy Buffet concerts? And, what else can you do with all those coconut shells (feel free to toss out ideas). 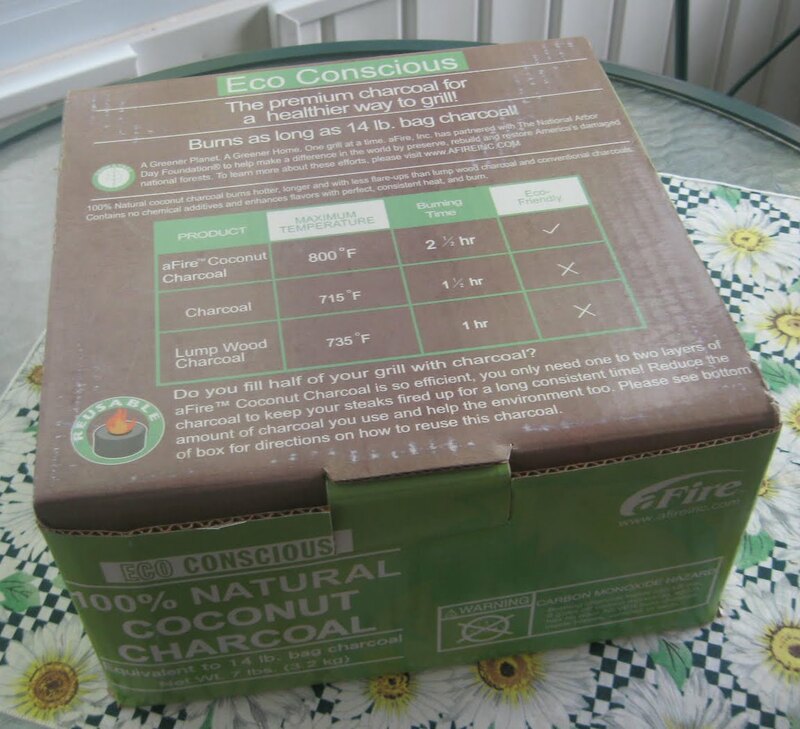 Afire does not add chemicals to the coconut charcoal either, so you get a clean burn. It is more like grilling with real wood rather than charcoal briquettes. There's no coconut flavor. The smell of the charcoal is rather neutral other than just having a grilling smoke smell with the foods on the grill taking center stage. I usually start my grill coals with a chimney starter. This means I never use lighter fluid which can give grilled foods an off taste. The chimney starter works great with briquettes like Kingsford, but I've found that natural lump charcoal will have small pieces that fall through and also that the natural lump shoots sparks out. I have to use a shield and get my battle sword out to start natural lump charcoal. Just kidding, but that is an issue. 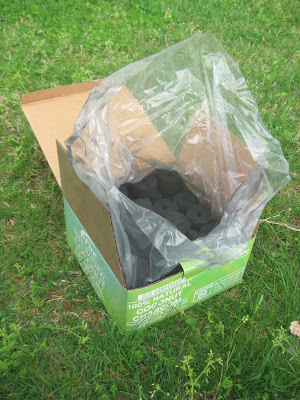 Coconut charcoal is even in terms of size, and it does not throw sparks out on my arms. The coconut shell charcoal does burn hotter than the other types of charcoal. I only had 16 pieces in the chimney starter (maybe 1/3 full), and it was so hot that I only snapped off two photos before giving that up (ouch). The company says the heat hits 800 degrees F, and I don't doubt that one bit. By comparison, natural lump tends to run at tops 735 F and briquettes 715 F. That's just typical. Your mileage may vary. 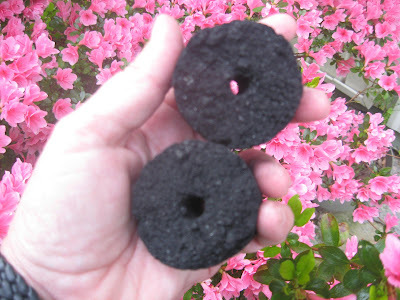 The little doughnut shaped coconut charcoals are very compact, so the comparison on burn times is that the seven pound box I bought would equal a 14 pound bag of regular charcoal. The price seems kind of high at $15 for seven pounds of coconut charcoal, but it does burn hot and slow with very little ash (and nice plus on clean up). Yes. 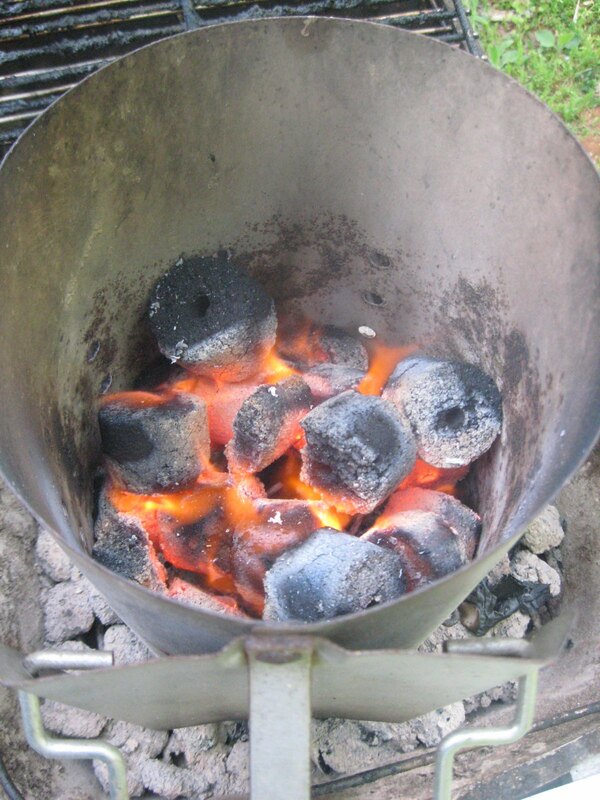 Coconut Charcoal Works for Low and Slow Too. I do high heat grilling (like steaks) but also low and slow. This grill out was a combination. I used a grill offset on the PK Outdoor Cooker (cast aluminum) and had coals to one side and none on the other. That's offset. 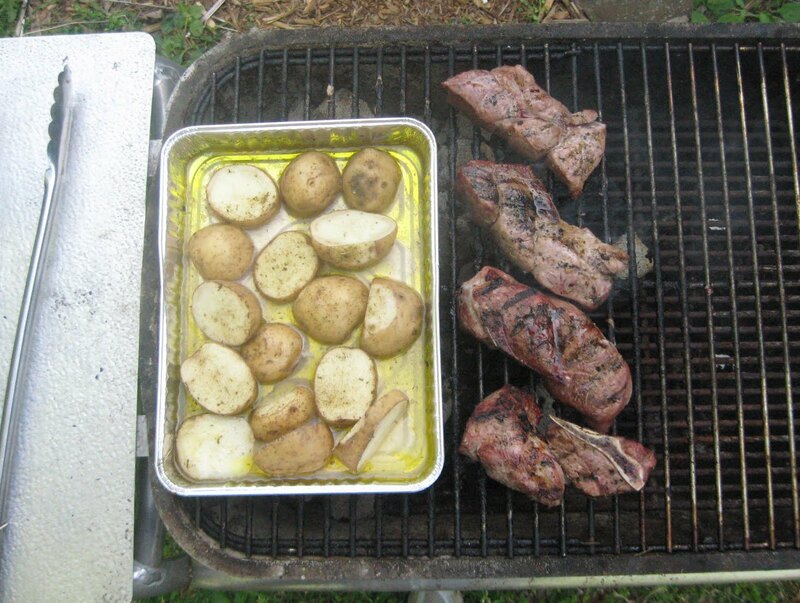 You have a hot area and a cooler area to do various things on your grill. The first thing I did was sear the country ribs. That was quick. I forgot to time, but I'd estimate that I had grill marks in under a minute over the coconut charcoal. I flipped the ribs and locked in both sides. The grill marks are really more for appearance than anything else, but still . . . Potatoes are a hard root vegetable and need pretty good heat. I put them over the coals and moved the country ribs to the edge of the hot coal area as you can see. But, I did not need 800 degrees at this point. To slow smoke but with decent heat, I closed the lid (convection grilling) and had the vents about half open top and bottom. That's less air, so I pulled the heat levels down. I'd guess I was in the 350 to 400 degree range based on the grilling times. 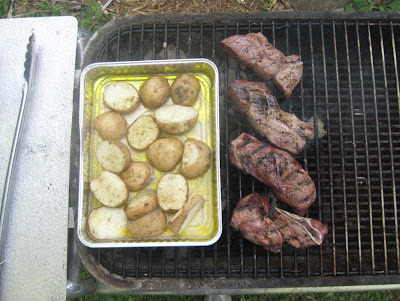 It took about an hour and fifteen minutes for the potatoes to be tender and the meat to be done with the set up as above. When I had finished grilling my meal, the coconut coals were still going strong. I closed off the vents so that some of that charcoal will be a bottom or base for the next grill out. Afire estimates that I get 2.5 hours cooking time with their charcoal versus 1.5 with regular charcoal and an hour on natural lump for the same amounts. I'm sure they put the best spin on it, but the coconut charcoal definately has staying power. I certainly could have thrown more meat on the grill, but I need to lose the 10 pounds I put on with the last grilling magazine project I worked on. I was impressed with the coconut shell charcoal. If you use other types of charcoal, then you'll have no problems getting the hang of using coconut charcoal. The main differences would be that you can get a hotter fire (unless you're closing the grill lid and playing with the vents to adjust that temperature), and the flavor is more like wood than like briquettes. Availability may be an issue. I can't buy coconut charcoal in my area, but this is not exactly progress-ville around here. I got my box through Amazon when someone gave me a gift certificate for Christmas. I wanted something fun, and I'd been looking at the coconut charcoal for quite a while. I haven't tried using coconut charcoal, but I was just looking at Afire's website today, I want to get some of their awesome planks. I tried to order last year, and Google was not working right. Ended up going through Amazon. I've only tried Afire coconut charcoal so far, but I'm impressed with the charcoal. By our current capability, we can produce in several packing and sizes. 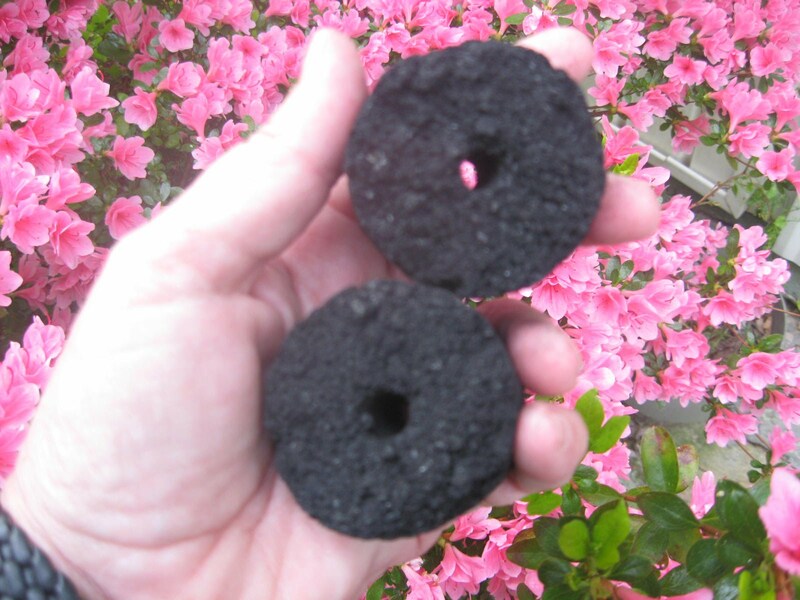 Our premium charcoal briquette are carefully produced from pure selected coconut shell and processed by skillful hand to to deliver the quality. So, give us a try and you will never look back. Is it similar to shisha charcoal?